Any Information please on this plate !! Can I just say what a fantastic and imformative website you have and thankyou for sharing your knowledge. 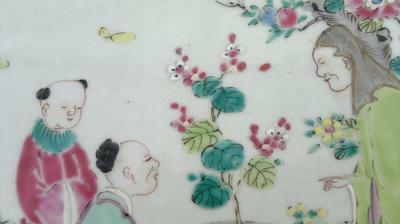 I have recently inherited a small collection of chinese porcelain and unfortunately I have no knowledge whatsoever. I was hoping you could help in identifying and sharing any knowledge you may be able to share with me about these items. 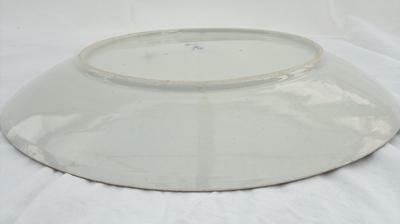 Here are a few pics of a plate i have, the diameter of the plate is 36.5cm. Comments for Any Information please on this plate !! Thankyou very much with all your help, it is greatly appreciated and helps give me an insight to the true history. Thankyou ! Any chance of help with some more? Thankyou very very much Peter for all your help, it is greatly appreciated, i will try myself to investigate further and seek out a japanese specialist. I have always been led to believe they were chinese, i have a pair. Sorry for any inconvenience and that they turned out to be japanese and not chinese, i know that's what you deal with here. I would greatly appreciate any help if you could identify several other items I have if i provided links to some pics, again i have always been led to believe they are chinese. Would this be possible ?? Please go ahead and post the others. 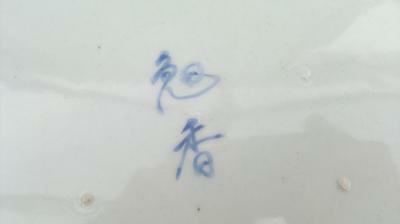 The hand-painted blue mark as well as the impressed mark you provided both are Japanese. Actually, the impressed mark is Japanese, it says "Yamatoku". 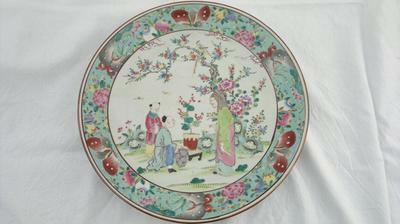 They are producing wares with Chinese motifs closely resembling Chinese wares. The only that put me on the right track were the marks and plate shape. Any information on this plate please !! I hope this os ok ? Just to let you know, there is also an impressed marking on the base of the plate that unfortuatley won't show up on photo, so I have tried to copy the mark onto paper, not brilliant but may help. The colour of the porceline on the underside is not white but is of pale green in colour. I hope this helps. Please let me know if I can do anything else to help. Hi, glad if I can be of help. Could you provide more pictures? From what I see in the current ones it seems to be old, but the mark is a bit different from regular Chinese marks. - more of the interior decoration, for checking on other details.